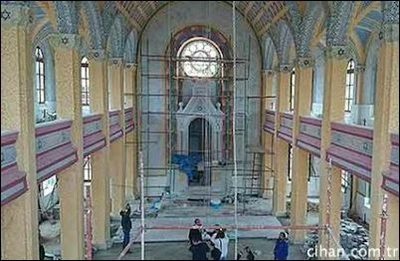 The "Great Synagogue" of Edirne has been under restoration since 2010. At the beginning of the 20th century, Edirne, a Turkish province in Thrace, hosted a prominent community of some 20,000 Jews – a larger community than the entire Jewish population of about 17,000 in Turkey today. Most of the Jews of Edirne were forced to leave the city after the pogroms of 1934. In 2000, the Jewish population in Edirne had dropped to 2 (no typo: two) people. Earlier, in the Ottoman Turkey of 1907, Sultan Abdulhamid had ordered the construction of what would become one of the world's two biggest synagogues (and Europe's biggest), known in Turkish as "Buyuk Sinagog," or the "Great Synagogue", in Edirne. As the Jews left the town, the Great Synagogue turned into a sorrowful wreck. In late 2000s, the Jewish community in Turkey applied to the governor's office in Edirne to have sermons and wedding ceremonies at the synagogue. Luckily, in 2010, the Great Synagogue was declared a historical site and brought under a $1.7 million restoration program to reopen for prayers and visits – not that the Turks thought the building would serve the (literally) couple of Jews left in town, but that they thought it could lure tourists (and money). The restoration work is almost complete. Last week, most Turks learned for the first time that there even was a synagogue in Edirne when the governor of the city threatened to forbid post-restoration prayers at the Great Synagogue and instead turn it into a museum. Governor Dursun Sahin said he would not allow prayers at the synagogue because Israeli security forces had attacked the al-Aqsa mosque in Jerusalem -- although Israeli police denied walking into the house of worship. Sahin said: "While those bandits (Israeli security forces) blow winds of war inside al-Aqsa and slay Muslims, we build their synagogues. I say this with a huge hatred inside me. We clean their (Jewish) graveyards, send their projects to boards. But the synagogue here will be registered only as a museum, and there will be no exhibitions inside it." No investigation has been launched for his hate speech, which literally contained the words "huge hatred." On the contrary, he must have won the hearts and minds of many important Turks in Ankara. At least the vengeful governor was honest. He said what he said admittedly "with a huge hatred" inside him. Not a hatred of what he perceives "as the Israeli government's actions against poor Palestinians," but what he evidently perceives as anything Jewish. As this author reminded readers here last week: "For most of Turkey's Islamists, there is no difference between the words 'Israel,' the 'Israeli government,' 'Jew' or a 'Turkish Jew:' They are all the same and are all regarded with hostility." Once again, the Turkish government silently nodded to the governor. Despite calls for his resignation, he remains in office. No investigation has been launched for his hate speech, which literally contained the words "huge hatred." On the contrary, he must have won the hearts and minds of many important Turks in Ankara. But once again, a few brave Turkish men stood up and the governor had to retreat. "I was misunderstood," the governor later said, apologetically. An opposition lawmaker had called for the governor's resignation for his remarks and demanded, in case the governor did not resign, that he be sacked by the government. "If Sahin does not resign to save the dignity of his post and Turkey's honor, he should be removed from his post immediately," Republican People's Party lawmaker Aykan Erdemir said in a written statement. "It is shameful for a public official to make such remarks. Hate-speech and anti-Semitism have seized the state. The hate speech often exhibited by the ruling politicians encourages public officials to follow suit." Erdemir was right. Only recently, a school teacher was caught having hung a signpost at the gate of the Neve Salom synagogue in Istanbul that read: "Building to be destroyed." The man was not prosecuted. Erdemir has suggested that a parliamentary commission should be formed to investigate "the rising anti-Semitism in Turkey." It is unlikely that the Islamist-majority parliament will agree with him. Erdemir was not the only one to defend the Great Synagogue. On Nov. 22, a group of activists who call themselves the "Young Civilians," a bunch of liberals, rushed to the Great Synagogue to protest against the governor. They issued a press release demanding, like Erdemir, the governor's resignation. The governor will not resign but will have to endure the embarrassment of what the Young Civilians, in a powerful line, recommended him to do: "This governor," they said, "has a lot to learn from Sultan Abdulhamid... He has a lot to learn from the young [Turkish] gendarmerie corporal who lost his life while protecting the Jews in Edirne from the looters during the 1934 pogroms." They also placed at the gate of the Great Synagogue placards that read, "They [Jews] are our people," "This synagogue was here when [the state of] Israel did not exist," and "This is Turkey's synagogue, not Israel's." The few brave men of Turkey did it, and the government had to step back. Adnan Ertem, the director general of the General Directorate of Foundations, the government department in charge of the synagogue, said that: "Our intention is to keep that building as a house of worship to serve all visitors." The synagogue, for the time being, is saved. The governor has probably scored good points to get a future promotion for the "huge hatred inside him." The opposition member of parliament, Erdemir, has probably added to his career of being a "Zionist" politician. The Young Civilians may soon have to go through a meticulous auditing of their books by government tax inspectors. And once again, hate speech in Turkey will not be prosecuted because it targets people who are not Sunni Muslim Turks.